Generations Alise Fine Art Paper is a new 100% cotton fine art paper with a smooth surface, ideal for photography and fine art reproductions. Also using the new Generations coating technology, Alise has a D-Max that is larger than any other cotton paper on the market. Alise is an acid free paper which is buffered for added longevity. The Alise papers are available in both a museum grade natural white coating and a photo grade bright white coating. PremierArt Platinum Rag is a 100% cotton paper with a luster surface resembling air dried fiber based Black and White paper. It's best used for images in which a gloss surface is desired. APPLICATIONS; Black & White Photography, Fine Art Photography, Portrait, Photography, Wedding Photography, Fine Art, Restorations, Panoramas. 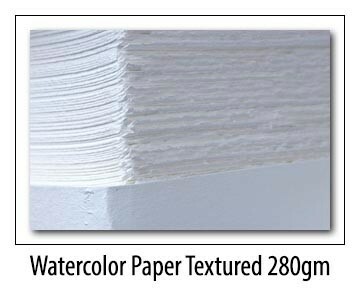 WaterColor Paper is a high textured cold press paper suitable for art and photographic images. Watercolor Paper is best used when a highly textured image is desired. This Alpha Cellulous paper is an economical alternative to cotton papers. It is acid and lignin free, and the base is buffered for longevity.